28 August 2013, at 12:00a.m. In the second part of research trialling slot reduction and closure technique for the British pig industry, BPEX has tested steel bar inserts. The results are published in no. 18 in its 'Research into Actions' series. 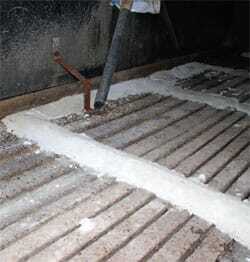 On-farm studies of concrete floors in pig buildings have found cases where the slot width exceeds the permitted maximum, often due to age or wear. UK farm assurance standards ensure that participating farms conform to the relevant legislation1. Farmers are, therefore, seeking remedial solutions and need to be confident of their efficacy. A series of evaluation trials was commissioned by BPEX to look at slot reduction and closure techniques which have recently been made available commercially. These include slot reducer inserts, steel bar inserts, slot closure inserts and compounds applied to surfaces. This publication refers to the trial where 8,000 steel bar inserts were installed on one farm. The assessments measured the interaction of the pigs with the floor with respect to welfare and durability of the device over time. Real Welfare-based assessments were used. need of a hospital pen. An open invitation was extended to potential suppliers of these devices to participate in this long-term evaluation. To date, one farm producing growers and finishers was used for the trial, which consisted of a series of treated and untreated pens to provide a comparison. After installation the farm had three visits over a period of several months, either by a veterinary surgeon or BPEX staff, to assess the welfare of the pigs using the Real Welfare outcomes measures as well as scoring for bursae on the legs. The slot is reduced using a length of flat mild steel bar 25mm × 6mm inserted with its long side vertical along the slot. The steel rests in a slot cut in the concrete at each end of the floor slot opening and held in place with a concrete resin compound. Being laid on its side means it is not possible for the pigs to dislodge the steel insert. The system is most suited to floors constructed of individual reinforced concrete beams where cutting the retaining slots will not affect the integrity of the floor strength. In practice, the steel is able to flex along its length as it is not fixed to the side of the concrete beam. This flexing is assumed to help the passage of faeces and but not cause a hazard to pigs’ feet. It should be noted that the comparison is made between pigs kept in pens with slot reducers versus the equivalent numbers of pigs in adjacent pens. The steel bar inserts were found to deliver a solution. To date, there appear to be no significant differences in the key parameters, e.g. body marks, lameness, bursae and tail-biting between pigs housed with, and without, the reducers. Additional measures considered, such as pigs requiring a hospital pen and the use of enrichment, were also not significantly different. For the trial, mild steel was used; for a longer term solution, stainless steel may prove a more durable alternative. BPEX will continue its monitoring longer term. 1 Regulations for concrete slats used for pig housing stipulate maximum and minimum dimensions for slot and beam width. The Welfare of Farmed Animals (England) Regulations 2007 (S.I. 2007 No. 2078), implementing European Council Directive 2001/88/EC). Go to our previous article in this BPEX series by clicking here.